Over the last 30 years, one thing that we've learned is that among elite athletes there isn't one style or "characteristic" that will guarantee success for every player. Look up and down the rosters of any All-Star team or HOF class and you'll find a wide variety of mechanics among the most successful players in the game. It's why we believe that there are infinite ways to pitch or hit, but there is one efficient way and that is based on what you can physically do. The ability to create maximum power with minimum effort. Knowing where the is ball in going. If you're not using your power sources appropriately, it's not most efficient. If you can't duplicate the movement, it's not most efficient. If you're less able to find the plate or barrel up the ball, it's not most efficient. 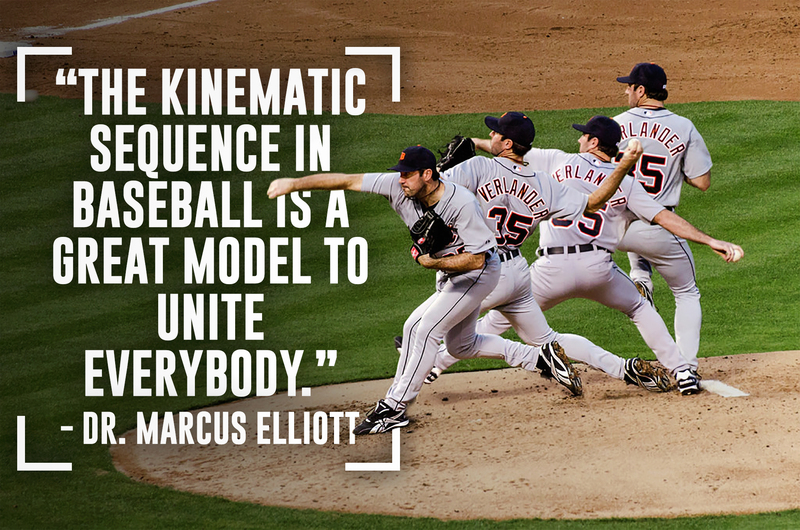 One of our favorite methods for evaluating efficiency is the kinematic sequence. We've posted clips on Twitter from our Level 1 Hitting seminar discussing the kinematic sequence in hitting, but haven't shared any data on pitching. Here's an example of the kinematic sequence of an elite pitcher who visited TPI recently. The details are different than with hitting, but the overall philosophy remains the same. This is an example of the identical sequence of speed or energy generation for the most efficient hitters and pitchers. Each segment of the body builds on the previous segment, increasing speed up the chain (red is less than green, which is less than blue, which is less than yellow). Each segment of the chain slows down once the next segment begins to accelerate. This is due to the distal segment pushing off the proximal segment. Imagine a child jumping off their dad's shoulders in a swimming pool. As the child jumps, the force rapidly slows down the dad's energy. This causes a sequential deceleration or stabilization of the segments. Though this is the sequence of the most efficient pitchers in the world, it's not necessarily the sequence of all successful pitchers. Proximal to distal (1-2-3-4) will always be the prerequisite for efficiency, but not for effectiveness. Here's an example of an elite pitcher who sequences 2-1-3-4. Does this pitcher have room to improve the efficiency of their kinematic sequence? Yes. Will it improve their "overall efficiency" as a pitcher? Not necessarily. Improving the order of their sequence might not work for every athlete in terms of consistency and control - in part - because every athlete is physically unique. 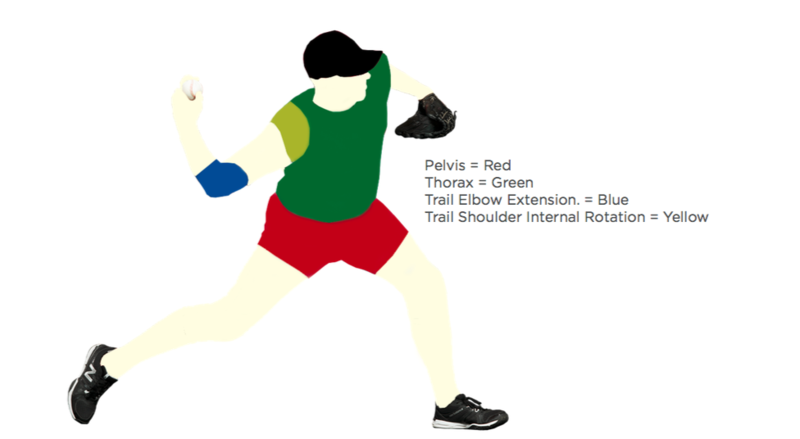 As Dr. Rose mentioned in the video, the pitcher with the inefficient sequence had limited contribution from his hips. One of the powerful things about the OnBaseU screen is the ability to link inefficiencies in the kinematic sequence to limitations in the body. For example, this pitcher failed OnBaseU screens related to mobility of the hip joint and flexibility of the groin such as the Push Off Test. The purpose of the Push Off Test is to evaluate how well a pitcher drives off the mound. The test is done in two parts: in Part 1, the pitcher steps out sideways as far as they can go (keeping their rear foot on the ground and parallel to the "rubber"). We like to see at least 5 foot lengths. In Part 2, we ask the pitcher to drive with the rear leg as if they were throwing a pitch. The gain in distance from Part 1 to Part 2 of the test should be at least half a foot. This athlete's performance on the Push Off screen was reflected in his stride length and overall contribution of the hip in his delivery. The screen suggests that limitations in the groin and hip (especially external mobility of the rear leg) are likely preventing him from taking a longer stride. Additionally, the pitcher created over 10% less dynamic vertical force with their push off leg than the pitcher in the first video (despite a significantly better performance in the vertical jump of TPI's power assessment). This particular characteristic wasn't the result of poor technique, but a physical limitation. By evaluating what the pitcher can physically do and understanding 3D data like the kinematic sequence, we not only have a good picture of the "what" but the "why." When we know the "why" behind an athlete's technique, we have a much better chance of knowing "how" to coach them to improvement.